We are proud of the people we serve every day. Our residents exemplify Family is Forever through their ability to love and care for the individuals, some related and some not, they call family. We celebrate their influence on our lives during National Assisted Living Week. Jack and Frances Abbott, 89- and 88-year-old residents at Westside Garden Plaza in Indianapolis, have made family everywhere they go. 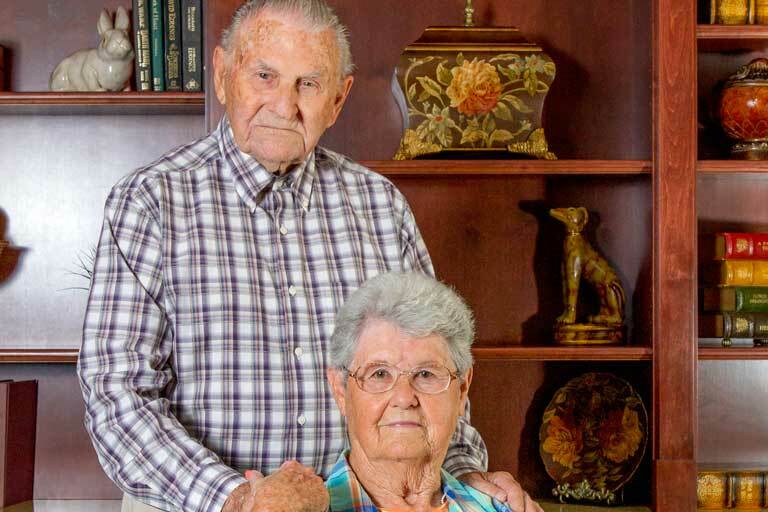 Married on Feb. 20, 1949, the couple is as close today as they were 69 years ago. “We still enjoy each other,” Frances said. The Abbotts have been living at the assisted living community for four years, and they depend on each other. Jack has Alzheimer’s disease and relies on Frances’ sharp mind. Frances has Parkinson’s and relies on Jack’s help with some physical challenges, like taking off her shoes. Their help extends beyond their door, to visitors taking a tour of the model room across the hall from their apartment. The couple invites the guests over to see what their own apartment looks like, and Frances answers their questions about the community. The couple uplifts their fellow residents as well, from encouraging their tablemate to play bingo with them to visiting sick residents and checking on their neighbors. Those around them have always become like family. Jack and Frances never had children of their own, but Frances’ brother and sister-in-law made sure their three children were involved in the Abbotts’ lives. “She’s the daughter that we couldn’t have,” Frances said of Flowers. The Abbotts love children and spent 20 years together as owners of Tri-County Sports, a sporting goods store in Mooresville, Indiana, that mostly sold equipment to children in school sports. Some of those children got to know them well over the years. “We still have kids who come to see us,” said Frances. Flowers connected that love of family to the Abbotts’ experience at Westside.